It's been a year since I started Back to Me. Have I gotten back to me? Not really. It's damn hard. I have been making bread though and it's much easier than self-actualization. I was inspired by Catherine Newman, who you should really be reading. Aside from the fact that I aspire to be her when I grow up, her recipes regularly get me cooking, which is about the only thing I am accomplishing around here these days. 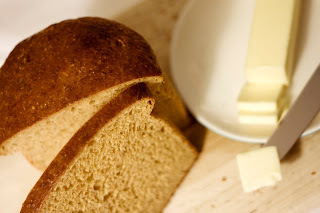 She sheepishly shared a recipe for bread, because well, who makes bread? Ma Ingalls makes bread. And that's not us. Oh, and my friend Joanne makes bread. But she could also make the entire Bronx Zoo out of fondant and gum paste. I digress. Bread. It's good. All you do is dump everything in a bowl and stir it up and then eat the gluteny, soggy dough straight out of the bowl. Ok, it's not that easy. Actually, the making part is easy, the baking, timing, finding the right vessel to cook it in part is trickier. My first loaves, Mark Bittman's fast no-knead whole wheat, didn't rise right, because the yeast was old. They are currently in the freezer awaiting a second life as croutons. My second loaves were delicious, and not at all surprisingly, when I made a loaf substituting white flour for the wheat, it was gone in a day or two. I think Adam would make like Jerry Seinfeld and steal a loaf of bread from an old woman, if it was white and free of any kind of grain. Last week, I made three whole wheat brioches from Artisan Bread in Five Minutes that turned out nearly perfect. I made them in a cool stone crock and they produced giant slices of perfectly shaped bread. Maybe I am Ma Ingalls? It's nice to start something and have it not quite work out and then approach it again and again, refining it each time. I realize that cooking as metaphor is all done now, thank you Julie Powell, but that kind of tenacity in other sectors of my life would be ok too. I would also love to make substitutions when necessary or start a second life as a crouton. For now, we've got bread. We all stand around the loaf, soaking up the smell and the accomplishment. And if we're Mimi we explain the parameters of the butter spreading on the first steamy slice in excruciating detail, and then we dig in. Sense memories in the making.